Was the first quarter really ‘Hot & Spicy’ or ‘Red’ for SpiceJet? In a previous piece, The Flying Engineer had estimated the operational profit of SpiceJet to lie in the INR “around or less than between INR 80 – 110 crore” range. The airline realised an operational profit of INR 70.7 crore. With the results declared exactly a week ago, we shall analyse the actual performance of the airline in Q1 FY 2015-16 (Q1’16). We first start with costs, as an airline usually has a better grip on costs than revenues. Capacity is measured in seat-kilometres (Available Seat Kilometre – ASK), and costs and revenues, from operations, are referenced to unit capacity. We compare Q1’16 with the same quarter in the last financial year – Q1’15. Average fuel price in Q1’16 was 28.4% lower than that in Q1’15. The fleet had also shrunk from a Bombardier Q400 : Boeing 737 ratio of around 1:2 to 1:1.3. This impacted fuel costs positively. Due to this ratio, a larger portion of the fuel burn was realised by the Q400s, which enjoy a flat 4% sales tax on fuel, as against as much as 28% sales tax in some airports, applicable to the Boeings. With operations being dominated more by the Q400s, which fly routes much shorter than the Boeings (upto 85% shorter routes on the domestic network), the average stage length had reduced, leading to an increase in the number of departures per unit capacity. More departures and hence landings per unit capacity translates to a higher fuel burn, but this was offset by the Q400’s lower fuel price and perhaps better fuel saving techniques employed at SpiceJet. Unit fuel costs fell by 30.3% despite fuel prices falling only 28.4%. The changed turboprop : mainline jet fleet ratio also affected lease costs. The Q400s are owned, and hence no lease is paid for such airplanes. As a result, the lease costs of the Boeings (including the wet leased Boeings and Airbuses) were diluted over a capacity that was generated in a larger part by the Q400s. Unit lease rental costs fell by 12%. Poor on time performance and increased cycles per unit capacity may have led to increased airport charges, though the Q400s do enjoy landing and navigation charges benefits. It is also possible that there may have been an increase in landing, navigation, other airport charges, in flight & other passenger amenities by authorities. Unit airport charges rose 14.8%. Aircraft maintenance costs were dominated in larger part by the Q400s, which were also utilised higher. The US Dollar strengthened 6.1% against the rupee, which would have led to increased costs. Maintenance costs for each Boeing are expected to have remained largely unchanged. Unit maintenance costs rose by 14.9%. The quarter witnessed no significant aircraft re-delivery activity, which dropped unit re-delivery expenses by 90.4%. Other operating costs rose by 45.7% per unit. Unit employee expenses were impacted by both having a smaller capacity, and the hike in salaries to crew to stop pilots from leaving the airline. This resulted in unit employee expenses rising by 25.5%. Depreciation and Amortisation expenses are largely dominated by the Q400s. With lower capacity, this expense was rose on a unit basis. Unit Depreciation and Amortisation costs rose 36.2%. Other expenses, which include a wide variety of costs including hotel and accommodation expenses for crew, dropped by 16.3% on a unit basis. Overall, unit costs dropped by 12.8%, aided largely by the absence of significant re-delivery expenses and the steep fall in fuel prices. The airline has scope to further streamline costs in at least three areas, with the other areas being out of the airline’s control. When streamlined, either through practices or scale, unit total operational expenses may further fall by 4.3%. With the present scale of operations and in the present environment, this translates to INR 45 crore. SpiceJet’s revenues were adversely impacted by lower airline capacity, poor on-time performance, and increased competition leading to lower prices. The first two factors may have made the airline lost high paying, time-sensitive and last minute (D0-D7) passengers. In the 13 month period June’14 to June’15, SpiceJet had the lowest OTP amongst private airlines for 9 months. Further, the cargo carried by the airline on a unit basis dropped by 4.9%, perhaps on account of Q400s dominating a larger part of the capacity. Unit sales fell by 1.1%. Other operating income rose by 56%. In total, operating revenues fell by 1% on a unit basis. In Q1’15, the sales per passenger (includes ancillary revenue) was a good INR 5,006 per passenger (at re-classified P&L figures). In Q1’16, the the sales was INR 4,215 per passenger. This represents a drop of 15.8% in the sales per passenger. Usually, a drop in the sales per passenger should not be a concern if the airline flies more passengers. However, a drop in net sales per passenger per ASK (the first number in the unit revenues and cost graph above) is a cause for worry. The drop was INR 0.05/seat-km). This shows that sales per passenger has dropped to a level that overall leads to lesser revenue despite very high load factors. To put things in perspective, the below graph shows the per passenger sales required to achieve the same net sales from operations, with varying load factors. For example, flying with load factors of 55% at INR 6,939 sales per passenger will generate the same sales as flying 90% load factor at INR 4,240. In Q1’16, SpiceJet had load factors of 90.5% (Domestic + International). In Q1’15, SpiceJet had load factors of 79% (Domestic + International). If SpiceJet was to have realised the same revenue in Q1’16 with only 79% load factors,the airline would have needed a per passenger sales of INR 4,833. However, the airline in Q1’15 (same quarter, last year) had a per passenger sale of INR 5,006. This means that had SpiceJet flown with Q1’15 load factors and per-passenger sales, would have realised an increase in sales of 3.6% or INR 39.53 crore in Q1’16. This shows that increase in load factors does not always imply an increase in either Revenue per seat kilometer (RASK) or total revenues. To have realised this additional INR 39.53 crore, SpiceJet should have generated sales of INR 4,366 per passenger (+INR 151) in Q1’16 at 90.5% load factors. Of course, unit revenues (RASK) is the most reliable method of gauging performance. But, in the case where RASK falls, the argument above is used to show that the load factor game must be played carefully. The above argument does not consider the fact that per passenger sales and/or RASK (RASK and per-passenger sales are not directly comparable) can be safely reduced when per passenger costs and/or CASK also reduce. Ultimately, profit is driven by the difference of revenues and costs, and not determined by either revenues or costs alone. Unit operating profit rose by 201%, despite a fall in unit revenues, largely due to a fall in costs. 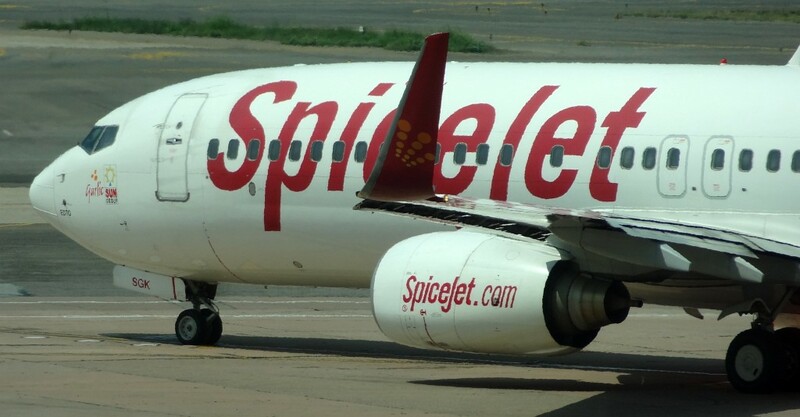 Fuel today accounts for 35% of the SpiceJet’s operating expenses. Last year, for the same quarter, fuel accounted for 43% of SpiceJet’s operating expenses. If aircraft fuel prices were at the 2014 April-June levels, the airline would have flown into the red. Had the airline maintained the unit revenues (RASK) of Q1’15, the airline would have generated an additional INR 11.4 crore over the Q1’16 operating revenue of INR 1,106 crore. Other income at the airline was INR 26.7 crore, against INR 28.9 crore in Q1’15 (re-classified). In Q1’16, other income (not from operations) and finance costs are almost equal, cancelling out each other. This makes profit in Q1’16 solely due to operating profits, unlike the Q4’15 quarter (ending March 31st 2015) where the airline stepped into profits due to the insurance payoff. Operating loss in Q4’15 was INR 102 crore. Operating loss before depreciation and amortisation expenses was INR 72 crore. Hot and Spicy or Red? The Hot and Spicy part is the reduction in finance costs. The Red part in in the operational costs and revenues. Overall, the airline has the potential to perform much better, and hence we’d consider the performance Red, despite the profit. The turnaround has started, but the airline is not yet ‘there’. Costs have to lean and revenues must grow. Good on time performance (OTP) is key. As seen above, sale per passenger and RASK have taken a hit, perhaps largely due to the poor OTP of SpiceJet, and in part due to competition.